Summary: With the phrase “fake news” being tossed around, often with little context, many are left wondering what the term means. In this post, we’ll explain what is generally regarded as fake news organizations: Sources that (likely knowingly) frame narratives by publishing rumors or falsehoods and omitting easily obtainable facts and basic context in order to support a conspiracy theory. In this example, we’ll cover InfoWars. Purportedly real news stories with little/no fact checking, often times with a forced narrative with the intention of advancing an agenda (ie. InfoWars). A hybrid of the above: clearly fake news but confusing to readers (often intentionally) with the intention of driving a specific narrative (ie. ‘The Pope endorses Trump‘). Here we’ll deal with the 2nd version, explain WHY sources like Info Wars are regarded as fake news, and explain why this should not be conflated with the occasional errors or even slight bias encountered in mainstream new sources. While the latter is unfortunate, comparing an imperfect journalistic process with the narrative-driven process that intentionally distorts the truth and omits basic fact checking is a false equivalence. It should also be noted that fake news organizations drive a sort of race to the bottom, as fake news stories often outperform real news in terms of engagement (in a business model where viewer impressions determine ad revenue, the lifeblood of online news sources). InfoWars.com falsely tied the BLM’s attempt to remove Cliven Bundy’s cattle and ranch itself in an effort to make space for a Chinese Solar Power pant. From here, InfoWars paints their usual narrative of a globalist takeover. However, a quick fact check on the power plant reveals that not only had the deal already fallen apart 2 years prior, but the location of the plant was about 80 miles away from Bundy Ranch. [Reid] and his oldest son, Rory, are both involved in an effort by a Chinese energy giant, ENN Energy Group, to build a $5 billion solar farm and panel manufacturing plant in the southern Nevada desert,” he wrote. “Reid has been one of the project’s most prominent advocates, helping recruit the company during a 2011 trip to China and applying his political muscle on behalf of the project in Nevada.…..Although these reports are in plain view, the mainstream media has so far ignored this link. 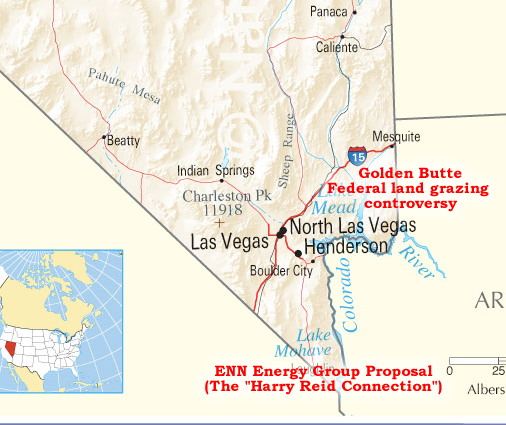 Of course, the location of the ENN solar farm would have been nowhere near Bundy Ranch, but in a completely different part of Nevada, which is why the mainstream media ignored the “link.” This false connection is just one of the many falsehoods spread by sites like Info Wars we covered in our Bundy Ranch fact check. The proposed Chinese solar farm that groups like InfoWars suggested was at the heart of the Bundy Ranch/BLM incident was nowhere near Bundy Ranch. This is not only untrue, the article author likely KNOWS this is untrue, otherwise they’d have linked to the BLM’s official statement, which was publicly available for all to see, and would have explained in depth the actual reasons. 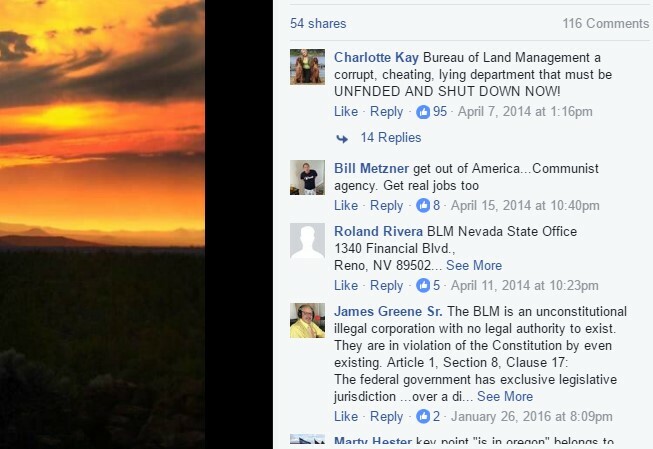 A 5-minute Google session would have also revealed that Bundy had been sued over his cattle’s trespassing and that a federal court had ordered the BLM to remove the cattle. Like many of these false narratives, the result has been sustained harassment of certain people, in this case, BLM employees. 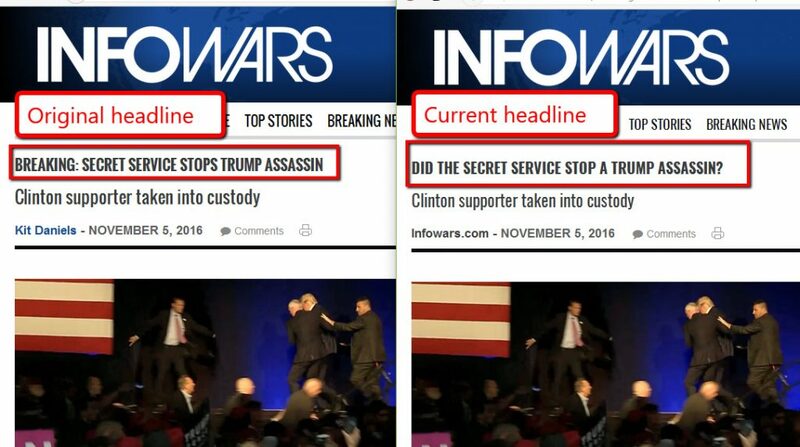 On November 5th 2016, Info Wars falsely claimed that the secret service prevented an assassination on Donald Trump, and implied that a Hillary Clinton supporter was at fault. In reality, an anti-Trump Republican protester was attacked by Trump supporters in the crowd. Someone yelled “gun” and the secret service escorted candidate Trump off of the stage. No gun was ever found. Update: Alex Jones is currently in a custody battle for his children. In defense of his wife’s accusations that Jones is unstable, his attorney claims he is a performance artist. Info Wars has consistently perpetuated the notion that Sandy Hook was a hoax or false flag. By the end of 2016, Alex Jones was ‘absolving’ Info Wars’ role in this by claiming they were simply noting there there were “unanswered questions.” This is a common tactic among conspiracy theorists (they’ll deny believing a conspiracy theory, but simply “asking questions” (thereby perpetuating it nonetheless). And of course, these questions ‘suggest’ a cover up of some sort. As we’ve pointed out, every situation will leave behind some unanswered questions. Furthermore, many not most of these “innocent questions” HAVE been in fact addressed. 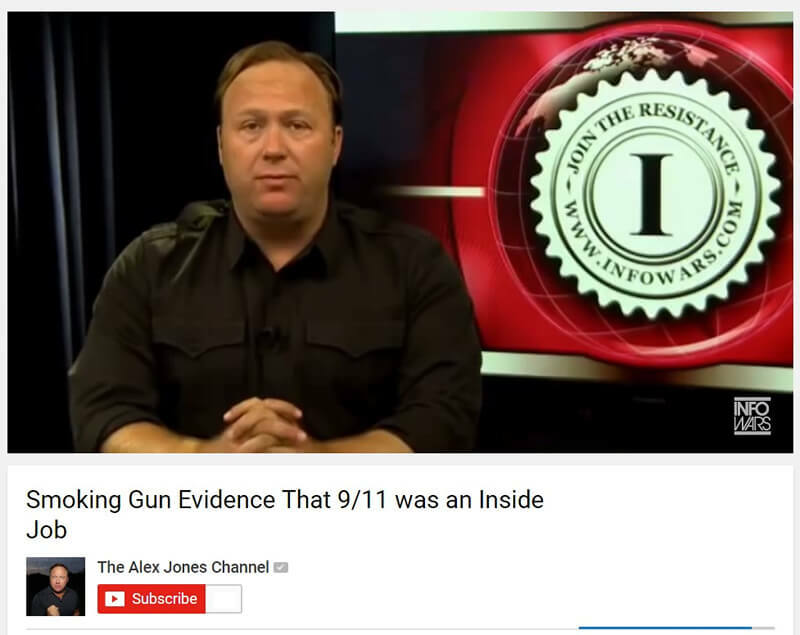 So by perpetuating the idea that the Sandy Hook incident contains unanswered questions (even though many of them have been answered) and operating from the false implication that having unanswered questions in the wake of a tragedy is somehow uncommon or even unexpected, sources like Info Wars continue to push their false narrative that this was a false flag being conducted as an excuse to disarm Americans, even though no significant gun laws were subsequently passed, despite the despite the notion that these shadowy powers also control the government. As part of their conspiracy theory narrative, InfoWars has referred to Milo Yiannopoulos’ ban as baseless. 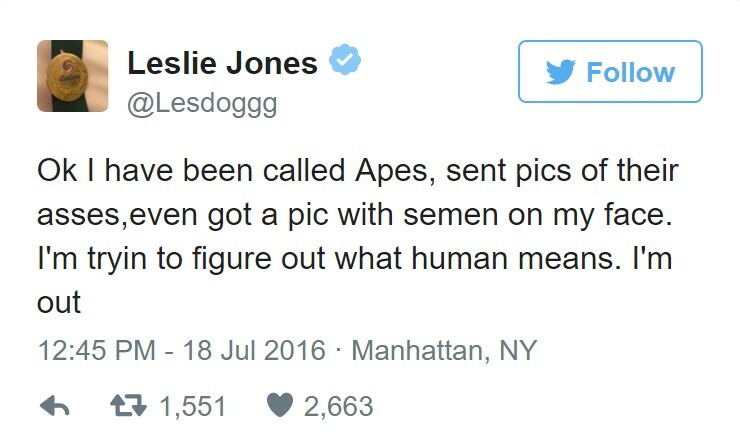 However, it’s clear that he was spoofing his Leslie Jones Tweets, making it looks as though she were making racist comments. 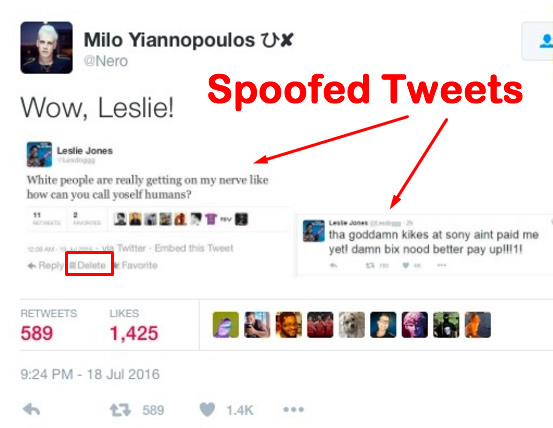 In response, Yiannopoulos’ followers sent Jones racist Tweets (see below). 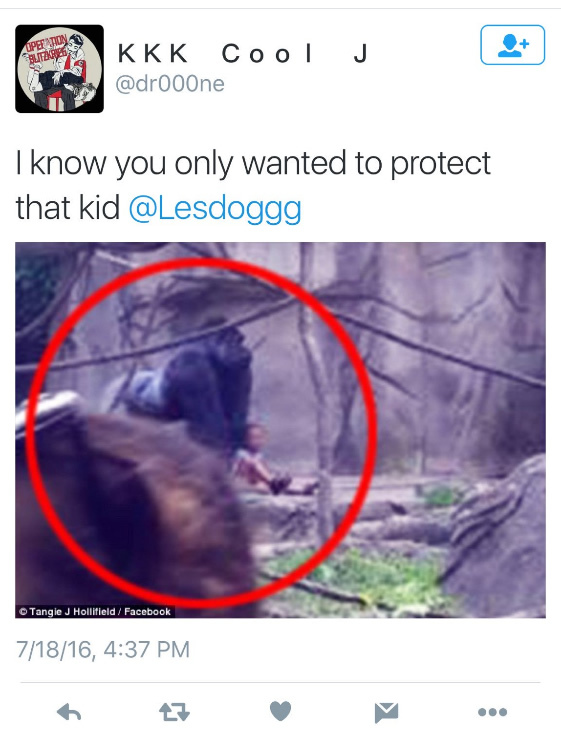 This was also not the first time he acted as a sort of ring leader on this type of harassment. InfoWars conveniently ignores this when they fill in the blanks with their conspiracy-based explanations for the ban. 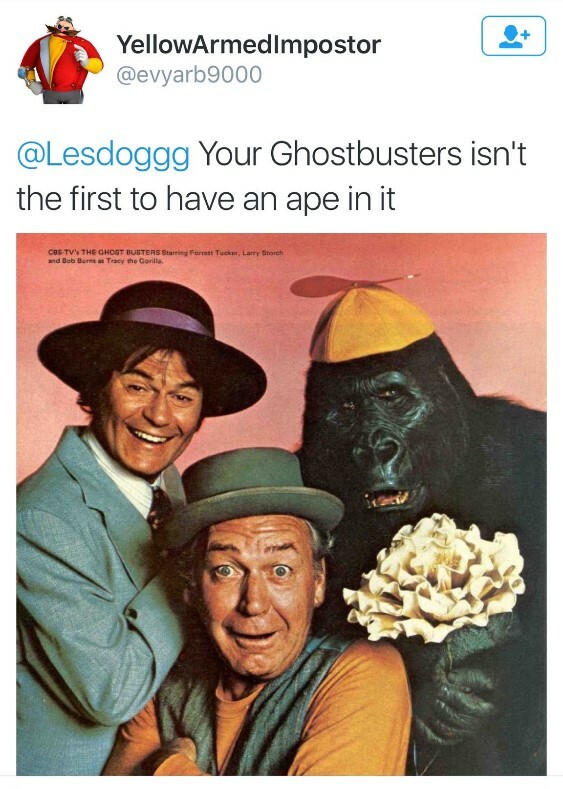 Racist Tweets sent by Milo’s followers. 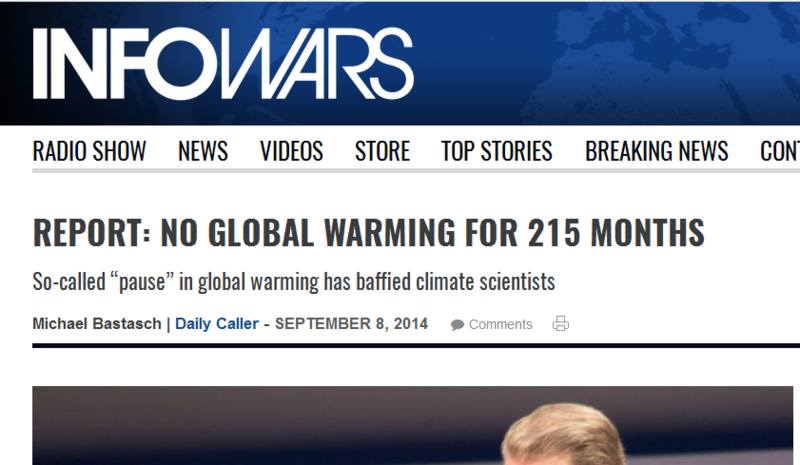 Info Wars has been at the forefront of climate change denial. For example, they’ve repeated the false claim that there has been no global warming since 1998. This myth has been a favorite for climate change deniers for some time. These are measured through various methods independent of one another (satellite observation, land temperature readings, visual confirmation, shoreline readings, etc). The claim that global warming has stopped focuses solely on atmospheric temperatures that come from satellite data, and even then the claim is still incorrect. What deniers are doing is cherry picking satellite data, using the exceptionally hot year of 1998 (El Nino) and comparing modern atmospheric temperatures to that one year. They are thereby ignoring the overall trend by cherry picking a couple of data points on the satellite record. Here is an explanation of the role satellite (atmospheric) data generally plays in confusion among non-climatologists. In fact, 90% of global warming heat goes into the oceans. Info Wars has repeatedly made the unsupported claim of massive voter fraud. The “25 million dead voters” claim comes from an Pew study which shows 24 million registrations are “invalid or inaccurate” and that more than 1.8 million dead people are currently registered to vote. As we’ve shown in the past, these are often due to mistakes by pollsters (ie. a man named Fred Smith registers to vote, and the pollster matches his registration to a Fred Smith who happens to be deceased), mistakes by the original audit (whereby the auditor made the mistake, not the pollster), and instances where a person has died since registering (it should be obvious that simply because such a person is still registered in a database, it doesn’t follow that a vote is being cast on their behalf). The ‘800,000 illegals voted for Hillary’ is based on a misunderstanding of a flawed study, which suggests that 6.4% of non-citizens vote, and 80% of that 6.4% would have voted for Hillary (this number comes out to just over 800,000). If accurate, this means over 800,000 non-citizens (not “illegals”) voted for Clinton. And given that the difference in popular vote was nearly 3 million, it would not have accounted for the disparity (this is relevant because Donald Trump has used this claim of fraud to explain his loss of the popular vote). So why is this study flawed? Assumes that the answers were correct, when in fact the questions were confusing and likely answered incorrectly as a result in some cases. Since Richman was trying to extrapolate from a very small fraction of respondents to the survey, even these very small amounts of measurement error could cause major problems for his analysis. To get a more valid estimate of non-citizen voting, we can look at the 85 respondents who said that they were non-citizens in both waves of the survey. Since this group answered the question the same way twice, we can be much more confident that they really are non-citizens. Among these 85 respondents, zero were matched to a valid vote record in 2010. That is, all of the non-citizen voters that Richman reports in his study for the 2010 election disappear once we ccount for measurement error. 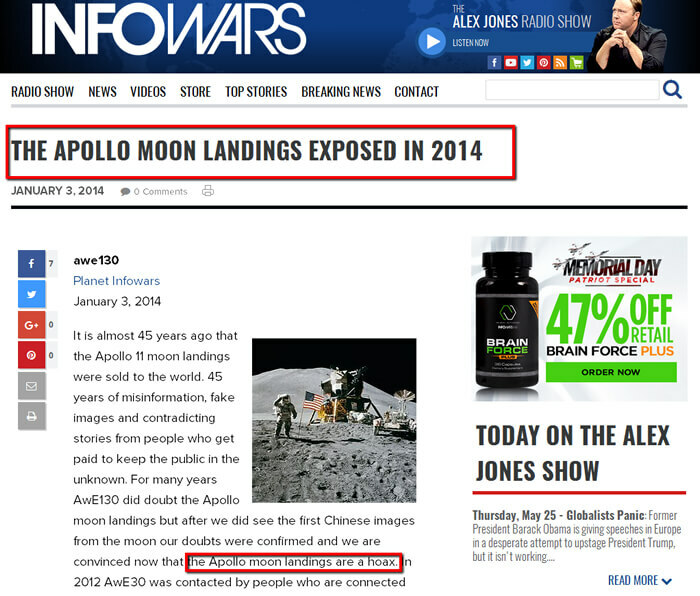 Yes, InfoWars peddled the idea that the moon landing was a hoax. The reasoning put forth in the article? The Chinese moon lander has shown us images from the moon that look nothing like the Apollo images. The first Chinese image from the moon are real, for the simple reason that if the Chinese would had faked the images they would had made the images look like the Apollo images. Why would the Chinese fake images from the moon and make them look different from the world wide excepted “real” Apollo images. The Chinese images have convinced AwE130 that that Apollo images are faked. There’s no explanation of how “different” the images are, but comparing images from the American and Chinese moon landings, it’s difficult to gauge what “difference” the article refers to. Certainly the images aren’t identical but they both appear to be to the moon. symbols are code for pedophilia-related concepts, and that some vaguely similar symbols could be found in other pizza places near Comet Ping Pong Pizza. 1- Appears to be no evidence that innocuous words found in these emails have been actual code for pedophilia-related concepts or activities. These seem to originate with 4Chan, and it’s unclear whether they were ever used on 4Chan for those topics or activities prior to the announcement of the “scandal.” In other words, it likely originated on 4Chan as an ad hoc conspiracy created for the sake of creating a conspiracy around these emails. 2-Are only so many possible shapes and patterns that logos come in, that there are bound to be similarities across unrelated logos/symbols. But here’s the thing, trying to map these symbols to CPP is a stretch. Unfortunately, this meme has had dire consequences for Comet Pizza’s business, and has even led to an intrusion by an armed individual who was looking to “investigate” based on what he’d read on the internet. Comet Ping Pong Pizza isn’t the only business to experience harassment. Other nearby businesses have also been targeted. The takeway lesson here (one of them, anyway) is that Fake News isn’t just some phenomenon that we should roll our collective eyes at and pretend it exists in some mythical vacuum. It has real consequences, including the influence of presidential elections. 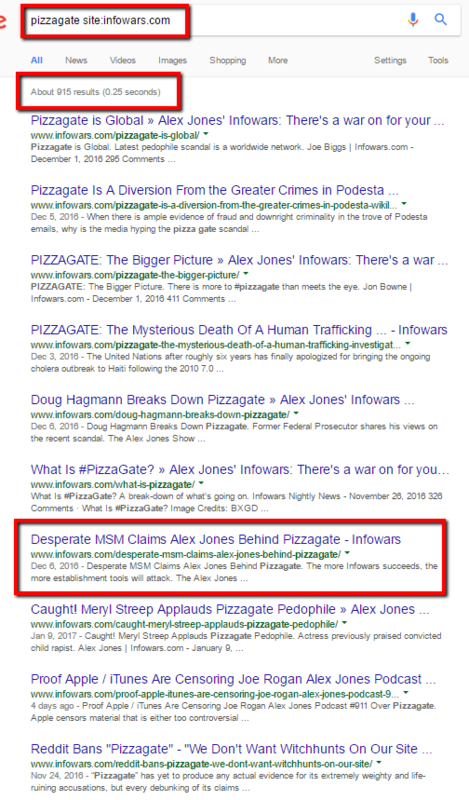 Alex Jones would later (5 months after the alleged scandal was publicized) apologize for his pizzagate coverage and addressed his apology to James Alefantis, owner of Comet Ping Pong Pizza. This was reportedly to avoid a lawsuit. 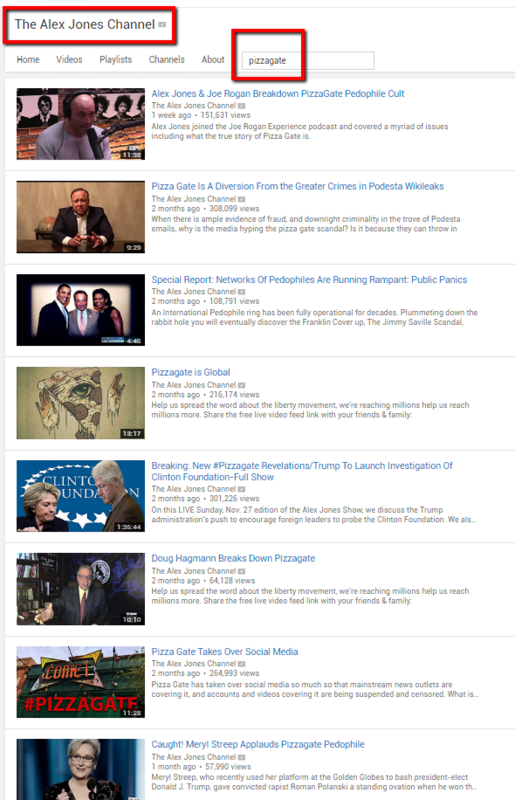 Purveyors of fake news outlets claiming that it’s the MSM providing fake news, since they are ignoring important stories like PizzaGate and the Sandy Hook Conspiracy instead of blowing the lid off of these important topics. Critics who conflate a major outlet’s occasional lack of adherence to journalistic standards (or discipline) with the intentional and consistent propagation of a false narrative through the publishing of hearsay and the omission of basic facts that we see with websites like InfoWars. Since the 1st point has already been addressed by showing that these “red pill” stories are false narratives and therefore being rightly ignored or barely regarded by mainstream outlets, we will focus on an example of the 2nd one. the journalism world tends to rely far more on trust than fact checking. When one news outlet runs a story, the rest of the journalism world tends to follow suit, each writing their own version of the story without ever going back to the original sources for verification. The second is that the news media is overly dependent on government sources. The third is that breaking news is a source of a tremendous amount of false and misleading news as rumors and falsehoods spread like wildfire in the absence of additional information. THIS reality where news outlets depend on advertising revenue to remain solvent and being the first to break a story is often at odds with the need for patient fact checking prior to breaking a story (in other words, their business model is often diametrically opposed to the concept of journalistic integrity) explains much if not the bulk of the instances where mainstream outlets report false narratives. While this should not be ignored, breaking a story before stringent fact checking can be conducted for fear of being scooped by a competitor (thereby losing out on exposure and ad revenue) should not be equated with intentionally creating a false narrative by purposely publishing rumors/hearsay (often obscuring the actual rumor/hearsay for added effect), skewing facts, and omitting readily-available facts. 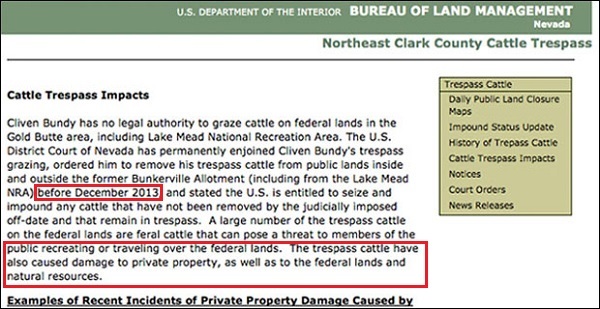 For example, when fake news outlets like InfoWars described the BLM’s attempt to remove Cliven Bundy’s cattle, the facts (that Bundy had lost a court case over this and hadn’t paid his cattle grazing fees for 20 years, that Nevada residents had been complaining about Bundy’s cattle trespassing on their land, that Habitat for horses had been complaining that Bundy’s trespassing cattle were eating into local equine’s staple diet, that the once-intended ENN solar farm was not only no longer intended to be built, but would have also been 80 or so miles away from Bundy Ranch) were easily available with some basic Googling. These were not facts that had yet to be released. But InfoWars was not interested in the facts, they were interested in promoting their Agenda 21 conspiracy narrative. At this point it seems futile to expect responsible fact checking from InfoWars or other similar websites. Nevertheless, it’s important to point out that THIS distinction of purposely distorting and omitting facts to drive a pre-conceived narrative is what makes sites like InfoWars a source of fake news. In reality, it’s nothing more than a business model that appeals to a certain set of people, including those prone to conspiracy thinking.